Before 1920, pilots landed their small planes on any convenient grass or dirt field. Locally, the areas now occupied by the OSU baseball field, Corvallis High School, the Hewlett Packard plant and Fairplay School. Benton County is still home to several grass or gravel strips maintained by individuals or companies for their own use. 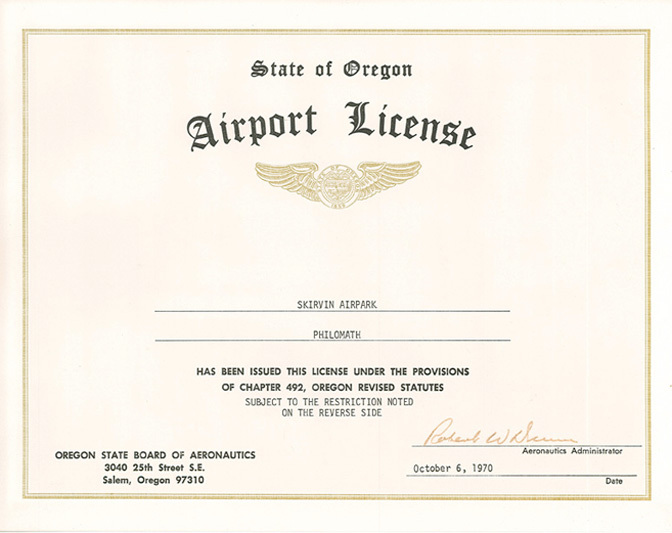 The Skirvin Airport was a small gravel airstrip along Applegate Street in Philomath. Ace Aero Service operated a crop dusting business there for a year or two. Then the Skirvin family maintained the strip for their own use and that of a few other private pilots until it was closed in 1983 to make room for offices and the rodeo grounds.